Saturday was the last day our local farmers’ market was open for the season. Which means this will be the last Market Monday post until next May. I am definitely going to miss my weekly visits to the farmers’ market, but with all of the holiday cooking and baking just ahead, I think the timing will be perfect. I decided to finish off the season with a sweet apple treat–Apple Pecan Praline Bread. This apple bread is beyond fabulous! It’s good even without the praline caramel topping, but the caramel is what really makes it stand out. 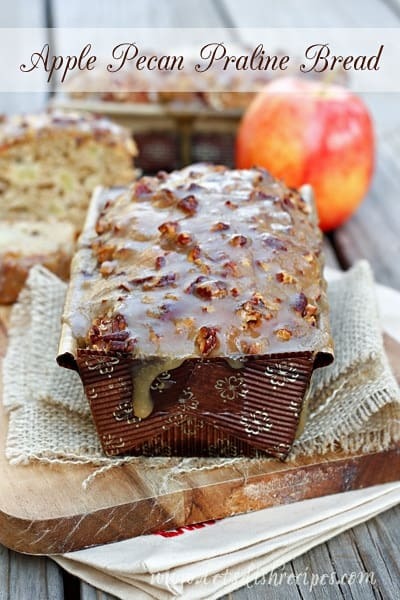 I mean, what’s not to love about a loaf of apple bread smothered in caramel topping? Apples and caramel are pretty much a match made in food heaven. My family loved this and devoured both loaves within a few days time. It’s definitely the best apple bread I’ve ever made! When choosing apples look for fruit that is firm to the touch. Avoid apples that are noticeably soft, bruised or discolored. A good apple should also have a pleasant aroma. 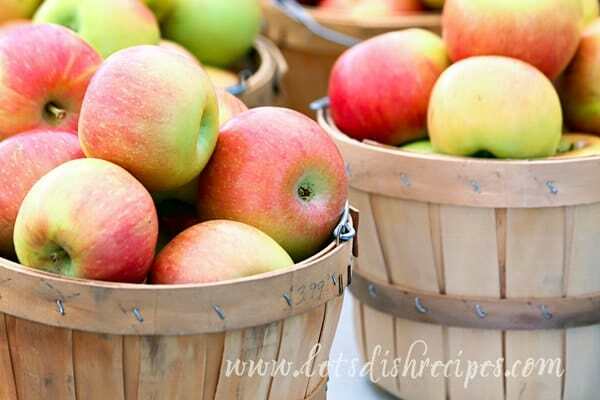 It’s also a good idea to get to know some of the more popular apple varieties. Some apples are better for baking and others are best for eating. You’ll get the best results when you choose an apple that is best suited to your cooking or eating needs. Preheat oven to 350 degrees. Toast 1/2 cup of the pecans in a single layer in a shallow pan for 5-7 minutes. With an electric mixer beat together sour cream, sugars, eggs and vanilla. In a medium bowl, stir together flour, baking powder, soda, cinnamon and salt. Add to sour cream mixture, beating just until blended. Stir in apples and 1/2 cup toasted pecans. Spoon batter into a greased and floured 9×5-inch loaf pan. Sprinkle with remaining 1 cup chopped pecans; lightly press pecans into batter. Bake for 1 hour to 1 hour and 10 minutes or until a wooden pick inserted in the center comes out clean. Cover loaf with aluminum foil after 50 minutes to prevent excessive browning. Cool in pan for 10-15 minutes before turning onto wire rack to cool completely. To make caramel topping, bring butter and brown sugar to a boil in a heavy saucepan over medium heat, stirring constantly; boil 1 minute. Remove from heat, and spoon over top of bread; let cool completely before serving. (about 1 hour). 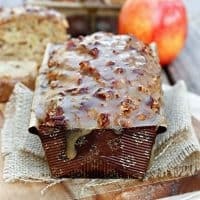 This Apple Pecan Praline Bread looks amazing. I’m pinning it to try later. Thanks for sharing. Oh my goodness, Danelle, this looks fabulous! I’d like to have a piece right this minute with my coffee! 🙂 Thank you so much for sharing your recipe and pinning! Have a wonderful Monday! I could seriously go for a hunk of that bread for breakfast – yum!